Musings Over a Barrel: Published! 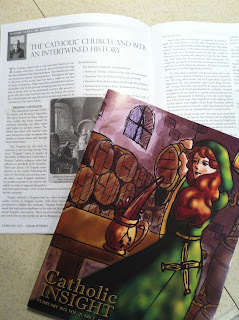 I have an article entitled "The Catholic Church and Beer, An Intertwined History" featured in the February issue of Catholic Insight magazine. Originally, the editors were interested in an article focusing on Saint Brigid and beer. I've made a number of blog posts on this interesting Saint as she's dear to our family. Interestingly, her Feast day February 1, is one of the busiest day for this blog each year as folks search for information on St. Brigid and her famous prayer. The article I submitted went beyond St. Brigid and provided, if I say so myself, an interesting retrospective of the Catholic Church's relationship with beer — from brewing monks to the patron Saints of brewing. Unfortunately, the print edition does not have an online version so I am unable to link to the article. Hopefully some blog readers are also subscribers. The Church has a long and interesting relationship with my favorite brewed beverage so it was a fun article to research and write. I even received a small honorarium that will go towards the beer fund!